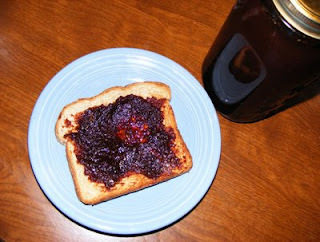 Oh how I love apple butter. I love it on toast or some good homemade biscuits. I love it in a spoon too. I have made apple butter for many of my 38 years. My grandmother started me on the path. She always made it for me when I was little. I can still smell the cinnamon in the air. Oh, wait...there is cinnamon in the air because I am making apple butter in my crock pot!! You will be shocked at just how easy it really is. Some people put vinegar in their apple butter. How gross is that?? Sorry but the truth hurts sometimes. I can always taste the vinegar. I think people do it so the the acid level will be high enough so that the butter will not ruin. I have never had that problem in my life. You just need to make sure that you watch the time when canning in a hot water bath. You can even store this in the fridge for 2 weeks with no problem. This year I am making the apple butter with organic jonagold apples from Iowa. They are so good. I have used all kinds of apples so just use what you have on hand and adjust the sugar to the particular apple you are using. Place apples into crockpot with water. Cook on high all day. That is at least 8 hours. Add sugar and cinnamon. Continue to cook overnight. Stir in the morning and see if it is thickness of warm pudding. If not continue to cook on high until this is reached. This is usually done when butter cooks overnight. Ladle into hot canning jars. Seal with canning lids. Place jars into a deep enough pan that you can place water 1 inch over jars. Process for 12 minutes. remove from pan and cool. Jars will be sealed when cooled. If not place into fridge and use within 2 weeks.